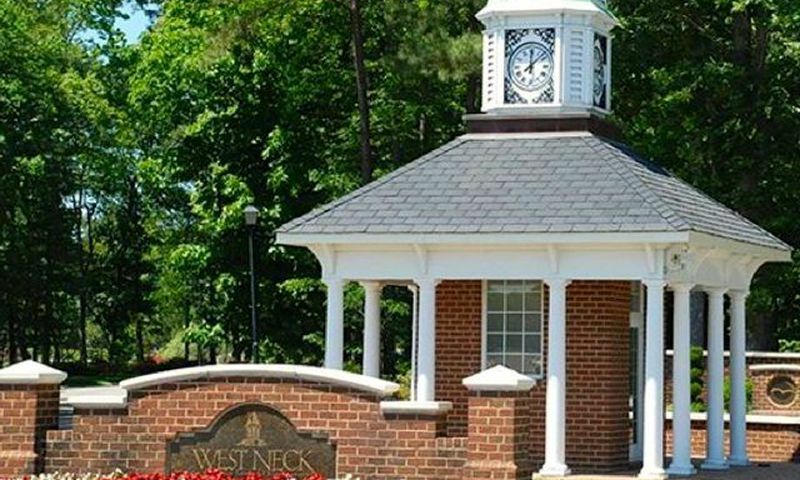 The Villages at West Neck is an exceptional 55+ community located in Virginia Beach, Virginia. This golf community offers many amenities and a large variety of activities where residents can live life to the fullest and make lifelong friends with neighbors. The Villages at West Neck began development in 2001 and is the first age-restricted community in Virginia Beach. West Neck is comprised of eight neighborhoods and 936 residences. Beautiful condos and single-family homes have been built around an attractive golf course with scenic ponds that accent the landscape. Built in 2009, West Neck s Village Hall features a 10,000 square-foot clubhouse that is the hub for social events and activities. Inside of Village Hall residents can workout in the fitness center, play cards in the game room, or rent a book in the community library. Village Hall even provides a catering kitchen, conference room, and large event room. Outside, there is a resort-style pool with a fire pit to enjoy the company of guests and neighbors. The Signature at West Neck Golf Course provides many membership opportunities for residents to golf or socialize around an 18-hole Arnold Palmer course that spreads throughout the community. The Signature s excellent two-story clubhouse is 24,000 square feet and provides causal dining at The Signature Grille, a fully stocked pro shop, and an elegant dining room for private events. In 2001, many reputable builders came together and began constructing neighborhoods throughout The Villages at West Neck. This VA age-restricted community is comprised of eight villages: two that are condo communities and six that provide single-family homes. In 2014, the community sold out and of the residences that make up West Neck Villages, 408 are condo units and 528 are single-family homes. All of these beautiful homes feature low-maintenance exteriors. The Browningstone and Wordsworth neighborhoods are the two neighborhoods that provide low-maintenance condominiums. The buildings in these neighborhoods provide units that range in size from 1,535 to over 1,900 square feet. Some condo units even include elevators to access homes on the upper level, as well as attached garages and private balconies. The rest of the neighborhoods within The Villages at West Neck are complete with single-family homes. These low-maintenance homes range in size from approximately 1,640 to 2,539 square feet. Built for active adults, these homes feature at least two bedrooms, two bathrooms, and a two-car garage with master suites on the first floor. There are many clubs and activities that cater to adults aged 55 or better. Residents can attend art and crafts classes, poker tournaments, and parties at West Neck s Village Hall. In addition, the community often plans brunches, dinners, and other exciting events that take place at the Village Hall. Since staying fit is proactive for an active adult, residents can attend water aerobics classes in the resort-style pool or condition in the fitness room. The Villages at West Next is located in Virginia Beach, Virginia just off of West Neck Road in the Princess Anne section of Virginia Beach. Grocery stores, amphitheaters, and many shopping centers are all within a five-mile radius. Living in the West Neck community puts you near some of Virginia Beach s most popular recreational destinations and golf courses. Sandbridge Beach and Mercers Marina is also located nearby for ideal beach getaways. Built in 2009, the Village Hall and pool are prized pieces of the community. Village Hall - 10,000 Sq. Ft. There are many membership opportunities for the residents of West Neck to obtain at The Signature at West Neck Golf Course. The Signature Clubhouse - 24,000 Sq. Ft. There are plenty of activities available in The Villages at West Neck. Here is a sample of some of the clubs, activities and classes offered here. The are two condo neighborhoods, Browningstone Village and Wordsworth Village. Browningstone Village has 108 condos while Wordsworth is complete with 50 buildings and 300 units. These two-story buildings have private garages on the first floor. The Avery, Boca, Carlyle, and Deville floor plans are located on upper level. And the Ashbrier and Biscayne floor plans are located on the lower level. These units range from about 1,550 to 1,890 square feet in size and have three bedroom and two bathrooms. Please Note: Not all condo floor plans are available at this time. Moved in little over a year. Neighbors are very friendly totally love the atmosphere here. Still work however when I come home it's like a retreat. Just love the community. Bought a condo here three years ago and have noticed a decline in the maintenance of the shrubbery. Just drive around in the Wordsworth area and take alook for yourself. The golf course is fantastic, the pool and clubhouse are incredible too. We feel like we live in a resort and couldn't be happier. I have a nice condo here and love it. I've got plenty of time to golf now that I don't have to do any of that pesky outside work around the house. The golf course here is great, the restaurant is good as is the pro shop. I hardly ever have to leave this place. 55places.com is not affiliated with the developer(s) or homeowners association of The Villages at West Neck. The information you submit is distributed to a 55places.com Partner Agent, who is a licensed real estate agent. The information regarding The Villages at West Neck has not been verified or approved by the developer or homeowners association. Please verify all information prior to purchasing. 55places.com is not responsible for any errors regarding the information displayed on this website.